Rwandan president Paul Kagame, left, and his Ugandan counterpart Yoweri Museveni meet at State House Entebbe on March 25, 2018. There are many reasons argued publicly and privately by officials on both sides of the conflict for the current border standoff between Rwanda and Uganda, but government insiders have nailed it down to one: Kampala's outright refusal to turn against a very prominent Rwandan businessman hugely invested in this country. 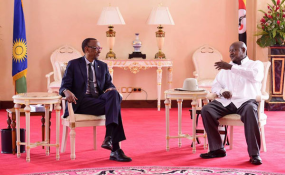 Two weeks before Rwanda closed its borders with Uganda on Wednesday last week, the Rwandan high commissioner to Kampala met President Museveni and communicated several requests for action against particular dissidents. A well-placed government of Uganda source has told The Observer that Maj Gen Frank Mugambage reportedly arrived with, among others, a request that Uganda should close businesses owned by Tribert Rujugiro Ayabatwa, a very wealthy Rwandan national running a string of enterprises in Uganda. The Rwandan government believes Rujugiro is pumping money into subversive activities being carried out on Ugandan soil against Kigali. Rujugiro is the man behind the Meridian Tobacco Company, a $20 million (Shs 72 billion) operation which opened in the West Nile town of Arua last year. The Arua plant is a subsidiary of Pan-African Tobacco group, the manufacturers of Supermatch cigarettes. But with Kampala not responding positively to the message delivered by Mugambage, tensions quickly mounted between the two countries. By Monday evening, Rwandan troops were seen deploying along hilltops near the common border. Days earlier, their Foreign Affairs minister Richard Sezibera accused Uganda of torturing and harassing Rwandan nationals here, while at the same time harbouring subversive elements plotting to topple the government in Kigali. Security sources tell The Observer that Rujugiro switched some of his investments to Uganda in 2013 after he fell out with Rwanda president Paul Kagame. A former close associate, Rujugiro was part of the 12-man presidential advisory council Kagame named in 2009, headed by former British prime minister Tony Blair. The government source said that Museveni demanded for proof from Mugambage that this businessman was indeed fanning activities designed to destabilise Rwanda. "The president of course asked for credible evidence to prove their claim because we can't simply close his businesses without a basis," the source said. "The president also asked Mugambage what assurance [Rwanda] had that if we close his [Rujugiro's] businesses, he will not find another channel [of funding the alleged activities] because he is an international businessman." Concerned about the 352 direct jobs which Rujugiro has created in Arua, and the 15,000 smallholder farmers plus another 1,600 occasional workers such as transporters doing business with Meridian, Museveni reportedly declined to grant Rwanda's request. Instead, he reportedly told Mugambage that he needed time to engage Rujugiro. Museveni is also understood to have said that he would either advise Rujugiro to find a buyer of his choice to take over the tobacco factory, or ask him to relocate the plant to another country. Kigali believes that a retired senior Ugandan military officer (names withheld), with very close links to a high office, holds a 15 per cent stake in the Arua tobacco factory. The other request Mugambage is said to have brought to the meeting was for Museveni to get an unnamed cattle keeper with a ranch in Bukomero, Kiboga district sent back to Rwanda. The said ranch is said to be stocked with over 1,000 head of cattle. "If you participated in the NRA liberation war, and you know how cattle keepers and other peasants aided the war, you are right to lose sleep over such a rancher," the security source said. Also on Mugambage's shopping list was a request that the owner of a bus company which plies the Dar-es-Salaam - Nairobi - Kampala - Kigali route be repatriated. Interviewed on Monday, government spokesman Ofwono Opondo declined to speak about the Rujugiro case. "We don't discuss particular individual cases, but Rwanda has been engaging the ministry of Foreign Affairs and security agencies with a list of low and high-profile people, some of whom came here as refugees, whom they say are involved in subversive activities," Opondo said. But given its adherence to UN protocols on refugees, Opondo said, Uganda has always worked with the UN to facilitate their relocation to other countries such as Canada. Rujugiro himself relocated from South Africa to Canada. Rujugiro first spoke about his fall-out with Kagame on November 20, 2013 on the Straight Talk Africa show hosted by Voice of America's Shaka Ssali. According to The News of Rwanda, a Kigali-based publication, Rujugiro's point of departure with Kagame came after his arrest in London following an arrest warrant issued by the South African prosecution office over alleged tax evasion. The tycoon allegedly expected Kigali to intervene on his behalf. But when no help came through, he turned against Kagame, linked up with Rwanda Defence Forces (RDF) deserters like Lt Gen Kayumba Nyamwasa and the late Patrick Karegeya to form the Rwanda National Congress (RNC). The RNC is one of the groups Kigali says is involved in clandestine activities against it from Uganda. That same year, the Rwandan government confiscated Rujugiro's properties as accusations of trying to topple Kagame's government and tax evasion increased against him. Two years ago, in September 2017, the Rwandan government through Rwanda Revenue Authority, auctioned Rujugiro's prestigious shopping mall in Kigali. Kigali Investment Company bought the mall at $8 million, $12 million lower than the amount Rujugiro claims to have spent constructing the building. According to an article published on January 1, 2019, by Forbes Magazine, an American business magazine, Rujugiro owns Africa's biggest tobacco company that has footprints in Burundi, Democratic Republic of Congo, South Africa, Tanzania, Nigeria, South Sudan and the United Arab Emirates. The magazine describes him as Africa's largest indigenous producer of cigarettes and other tobacco products, and puts his annual revenue at more than $200 million, with more than 7,000 employees. Voice of America in 2013 also reported that besides cigarettes, Rujugiro is into tea processing, manufacture of plastic shoes and cement with factories in ten African countries. The radio also said he is trading in 27 African countries and the Middle East. Rujugiro's business dealings can be traced to as far back as 1978 in Burundi where he lived as a refugee.